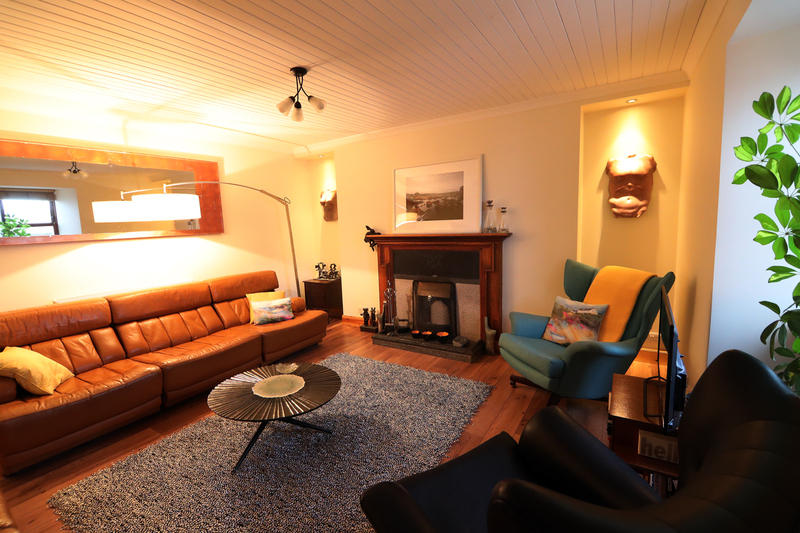 The interior has been fully renovated, re-wired, re-plumbed and insulated to be a warm and comfortable home from home. A spacious kitchen diner with induction hob, electric fan oven and grill, fridge freezer, filter coffee machine, kettle, 4 slice toaster, washing machine, dishwasher, microwave, dining table to seat 6, all crockery, pots and pans. A comfortable lounge with a range of soft seating including large sofas, bespoke wing swivel armchairs and footstool. A 32" LED TV and DVD player, books, DVDs and CDS, and wifi are there to entertain you as you relax after a wonderful day exploring Shetland's beauty. On the first floor, both bedrooms are of a good size: one with a 6' super-king size bed, which can be split to 2 full sized twin beds if required; and the other with a kingsize bed and a single bed. High quality bedding and mattresses will help you enjoy a great night's sleep, as will our fresh sea air. Both bedrooms have partial harbour/ water views. On the landing there is a newly fitted bathroom with a rainhead shower over the bath and a basin. There is a separate wc and wash hand basin. Outside there is a private courtyard, which offers a secluded and peaceful place to sit. It is a very pleasant oasis, yet still in the heart of the town.